'Life is like a box of chocolates. You never know what you are going to get.' 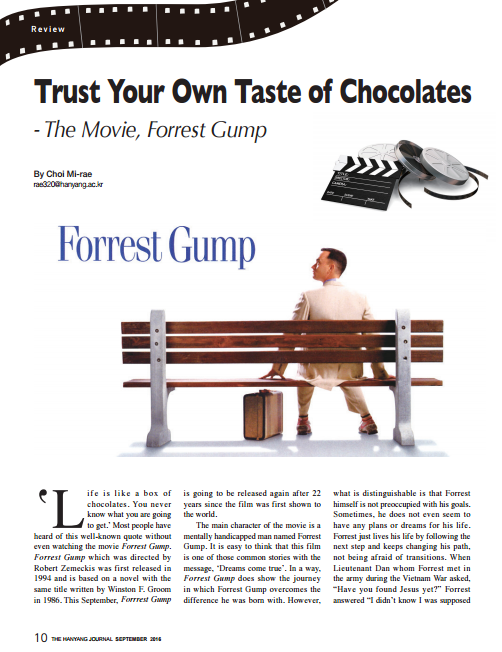 Most people have heard of this well-known quote without even watching the movie Forrest Gump. Forrest Gump which was directed by Robert Zemeckis was first released in 1994 and is based on a novel with the same title written by Winston F. Groom in 1986. 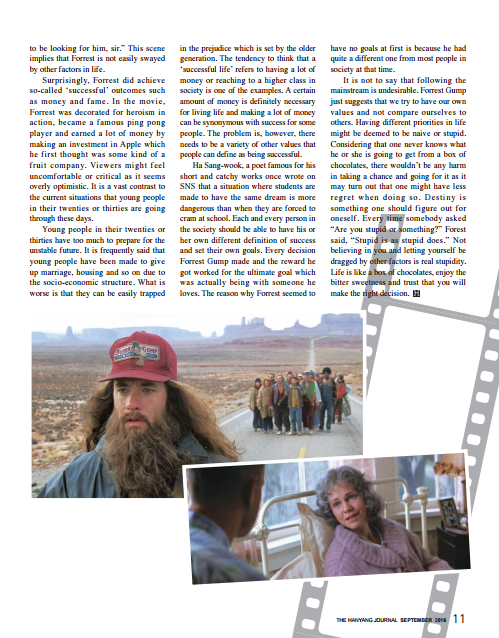 This September, Forrrest Gump is going to be released again after 22 years since the film was first shown to the world. The main character of the movie is a mentally handicapped man named Forrest Gump. It is easy to think that this film is one of those common stories with the message, ‘Dreams come true’. In a way, Forrest Gump does show the journey in which Forrest Gump overcomes the difference he was born with. However, what is distinguishable is that Forrest himself is not preoccupied with his goals. Sometimes, he does not even seem to have any plans or dreams for his life. Forrest just lives his life by following the next step and keeps changing his path, not being afraid of transitions. When Lieutenant Dan whom Forrest met in the army during the Vietnam War asked, “Have you found Jesus yet?” Forrest answered “I didn't know I was supposed to be looking for him, sir.” This scene implies that Forrest is not easily swayed by other factors in life. Surprisingly, Forrest did achieve so-called ‘successful’ outcomes such as money and fame. In the movie, Forrest was decorated for heroism in action, became a famous ping pong player and earned a lot of money by making an investment in Apple which he first thought was some kind of a fruit company. Viewers might feel uncomfortable or critical as it seems overly optimistic. It is a vast contrast to the current situations that young people in their twenties or thirties are going through these days. Young people in their twenties or thirties have too much to prepare for the unstable future. It is frequently said that young people have been made to give up marriage, housing and so on due to the socio-economic structure. What is worse is that they can be easily trapped in the prejudice which is set by the older generation. The tendency to think that a ‘successful life’ refers to having a lot of money or reaching to a higher class in society is one of the examples. A certain amount of money is definitely necessary for living life and making a lot of money can be synonymous with success for some people. The problem is, however, there needs to be a variety of other values that people can define as being successful. Ha Sang-wook, a poet famous for his short and catchy works once wrote on SNS that a situation where students are made to have the same dream is more dangerous than when they are forced to cram at school. Each and every person in the society should be able to have his or her own different definition of success and set their own goals. Every decision Forrest Gump made and the reward he got worked for the ultimate goal which was actually being with someone he loves. The reason why Forrest seemed to have no goals at first is because he had quite a different one from most people in society at that time. It is not to say that following the mainstream is undesirable. Forrest Gump just suggests that we try to have our own values and not compare ourselves to others. Having different priorities in life might be deemed to be naive or stupid. Considering that one never knows what he or she is going to get from a box of chocolates, there wouldn’t be any harm in taking a chance and going for it as it may turn out that one might have less regret when doing so. Destiny is something one should figure out for oneself. Every time somebody asked “Are you stupid or something?” Forest said, “Stupid is as stupid does.” Not believing in you and letting yourself be dragged by other factors is real stupidity. Life is like a box of chocolates, enjoy the bitter sweetness and trust that you will make the right decision.